The solar stocks had a bad time during the second half of 2015 until 2016, although they recovered in 2017. As a matter of fact, the ETF, which was tracking the Guggenheim Solar ETF, has seen an impressive return of more than 54% in the previous year. The federal tax credits on home solar installation, as well as other incentives that stimulate the industry, are among the reasons why the solar stocks have risen in the past. Yet the sector was being resilient in 2017 even in a time where the presidential administration doesn’t prioritize renewable energy in the same way as the previous administration did. After a somewhat disappointing performance in 2016, when their revenue went down to almost 20%, First Solar had a remarkable year in 2017. After the company beat consensus estimates during the first quarters of 2017, results in the 3rd quarter were far more impressive – with revenue of $1.09 billion. This figure represents a 60% growth which crushed the estimate of $824.2 million. Although the company didn’t meet expectations during the 4th quarter, an adjusted loss of 25 cents for share came in better than the expected loss of 33 cents. 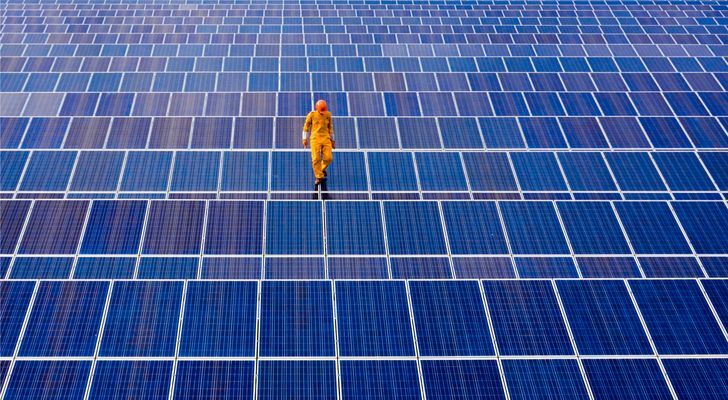 First Solar can benefit from the tariff decision of Trump since the company uses thin solar panels, a technology that’s different from what’s used by Chinese companies that Trump’s tariffs are trying to protect the US from. SunPower went down by more than 70% of its overall value during the entire course of 2016, a figure that triggered fear among its investors. Bankruptcy is the number one concern among solar stocks, however, SunPower is mainly owned by Total S.A, a petroleum giant, which props the solar company up with credit and even bought solar panels to be used by its 5,000 gas stations. The company is spending money on its new technology in order to boost the efficiency of solar panels and move to utility-scale projects that could become a game changer in the company’s balance sheet. Vivint Solar is a company aimed at the residential market, providing both storage and rooftop solar solutions. Their stock showed a good performance in June of 2017, rallying at more than 80% after analysts at Goldman Sachs upgraded the shares to purchase and almost doubled their target price to $6 from $3.50. However, the shares of Vivint gave up most of these gains. Nevertheless, the stock ended in 2017 up by almost 56% for the entire year and after suffering from volatility in the first half of the year 2018, the company has now recovered and has enjoyed a 52-week high of more than $6 in the summer and is currently trading at $5.20 per share, which is up by 30%.